Today a good friend turned us on to Tathagata, yet another nutbag who claims to be the Maitreya Buddha, awaited by crystal-grippers all over the world to usher in the New Age™ we've all been waiting for. 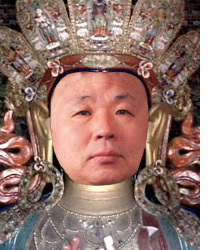 Looking a bit like a cross between two other Koreans, Kim Jong Il and Sun Yung Moon, Tathagata clearly belongs in a psych ward with the other Buddhas, Napoleons, Jesus Christs and George Washingtons. In other words, a bump on your forehead and the grandiose delusion you're here to save the world do not a Buddha make. Tathagata clearly belongs in a psych ward with the other Buddhas, Napoleons, Jesus Christs and George Washingtons. And the Aleister Crowleys. Don't forget the Aleister Crowleys. He does look like the Rev SYMoon doesn't he? Who falls for this transparent scammery? I really think Tathagata with the headpiece, Nithyananda dressed in his golden robes, meera with the cowboy hat, and Sri Maa Lakshmi should come together to form a new rock band along the lines of Village People. They would spread enlightenment a lot faster that way. I wanna do the Tathagata boogie. yeah! Oh yeah, and Jaxon bear needs to be part of the band too, of course with the top hat. Yo! You best not be dissing the pimp hat! Jody, you need to do a photo collage with all 5 of them together and then put it on a bill board, titled "Enlightenment Now! ", somewhere in Austin. That would be awesome. Jaxon Bear needs a big gold medallion, though. Now can any one of you show the grounds for denying his enlightenment ? Has anyone here actually looked at what he wrote? His claim to be the Maitreya Buddha refutes anything he writes. He's a nutbag for believing this about himself, making his writing the product of insanity rather than enlightenment. I'm wondering where he claimed that but I can't find any evidence of it. Can you show me where you read it? Can you show me where you read it? I read it here, but it looks like the Maitreya reference was edited out. However, there is so much other nonsense on that site that he comes off as nothing more than a grandisose nincompoop in love with the idea of being a savior. This is the purview of madness and narcissism rather than true spiritual understanding, IMO. The next generation will call me as Maitreya Buddha when they understand my life. This proves it. The guy is a pompous narcissist with pathological grandiosity issues. Enlightenment isn't nearly the big deal he's making it out to be, proving his own narcissistic inflation.